Located in the southeast corner of the second floor of the original tavern. This room is large and airy with high ceilings. It features an attached dressing room and full bathroom. It contains two three-quarter double beds and has views of our lawn and gardens. Located in the southwest corner of the second floor of the original tavern. This room features a working fireplace and views of our lawn and the valley to the west. This room contains a queen bed and full bathroom. Located on the ground floor of the old carriage house at the back of the inn. 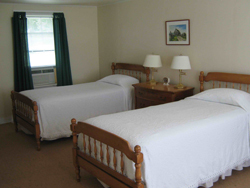 This room features twin beds and a full bathroom. It faces south looking out onto our lawn with outdoor seating and tables. This room is particularly well suited for guests who wish to avoid stairs or other obstacles. It is also air conditioned. 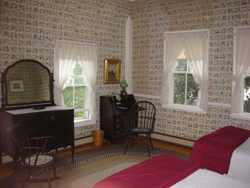 Located on the second floor of the old carriage house at the back of the inn. 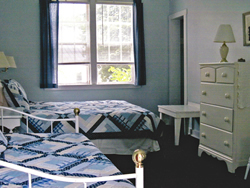 This room features a queen bed, a day bed, and a three-quarter bathroom. It has windows facing south and north with nice views of the lawn. Located on the second floor of the old carriage house at the back of the inn. This room features a queen bed, a day bed and a three-quarter bathroom. This room has a nice view of the lawn and is air conditioned. 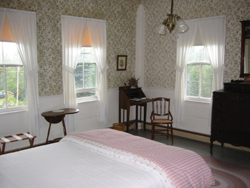 Located on the second floor of the old carriage house at the back of the inn. 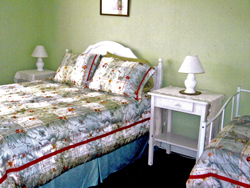 This room features a queen size bed and a three-quarter bathroom. It faces south with views of the lawn and garden. Rates: All quoted rates are European Plan (no meals included), dbl. occ. A 9% NH Rooms & Meals tax is additional. Prices subject to change. A weekly rate is also available as well as specials and single rates excluding camp visiting dates and other special events. Deposits: A deposit of $100 per room is required to guarantee a reservation. If you leave early your deposit will be returned only if we are able to rent the room to other guests. Deposits are credited on the final bill. Cancellations: If a reservation is canceled more than two weeks in advance, the deposit will be returned. Less than two weeks in advance the deposit will be returned contingent upon our subsequently renting the room for the dates in question. In any event, a $10 service charge will be accessed on all returned deposits. Arrivals: We request that all guests check in before 6:00 pm unless prior arrangements have been made with us. Departures: Check out time is 11:00 am although a later time can often be arranged. 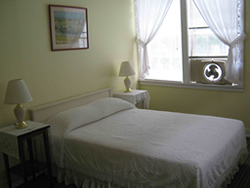 Pets: Well-behaved pets are allowed in the Carriage House rooms for an additional charge of $20 per night. Please contact us ahead of time for further information and conditions. Meals: Breakfast is served form 8:00-9:30 am daily. Other meals can be obtained when arrangements are made in advance.